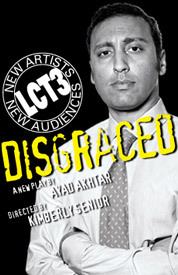 This year's Pulitzer Prize for Drama has been awarded to Ayad Akhtar's Disgraced, a play which premiered in Chicago in January, 2012, at the American Theater Company. Director Kimberly Senior then took the production to New York, where it played in the Clair Tow Theater at Lincoln Center from September to December, 2012. Disgraced concerns Amir Kapoor, a Pakistani-American lawyer who has enjoyed a great deal of success within a prestigious New York firm. He lives on the Upper West Side in a beautiful apartment with a beautiful (white) wife, enjoying all the material accoutrements that accompany his status as a big-shot lawyer. To achieve that success, he's suppressed and hidden the parts of his identity related to Islam. But his wife, who is an artist, has incorporated Muslim motifs into her work. And when she throws a dinner party for a mixed group of guests, all those forces of identity, religion and culture collide. As you can see from the poster image from Lincoln Center reproduced here, Aasif Mandvi from The Daily Show played Amir in the New York production. To see video clips from that production, click here or here (under the "Works" tab). Other plays considered for this year's Pulitzer were Gina Gionfriddo's Rapture, Blister, Burn, which the Pulitzer committee calls "a searing comedy that examines the psyches of two women in midlife as they ruefully question the differing choices they have made," and Amy Herzog's 4000 Miles, "a drama that shows acute understanding of human idiosyncrasy as a spiky 91-year-old locks horns with her rudderless 21-year-old grandson who shows up at her Greenwich Village apartment after a disastrous cross-country bike trip."